Yeah, but: It was going to get repeated readings anyway. 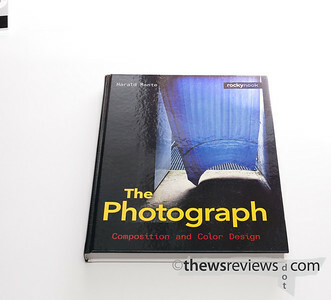 The Long Version: The unassumingly titled book "The Photograph" by Harald Mante is undoubtedly the most significant book on photographic composition I have ever read. (handy link to Amazon.com .) 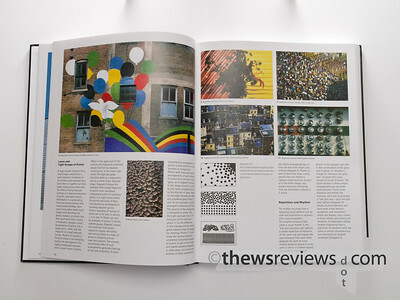 Its subtitle "Composition and Color Design" gives the theme of the book, which looks at the photograph without any reference to the subject matter. 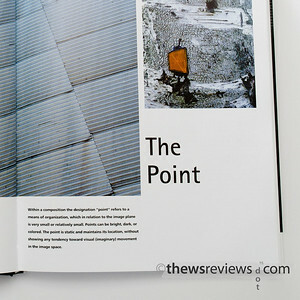 This is purely a book of design, something of a cross between the approaches of Freeman Patterson and The Tao of Photography , but with a more analytical eye. The photographs, all taken by the author, have the highest "I wish I had taken that" factor of any collection that I have seen. Other people may be less impressed, or less receptive to this compositional guide, but for me it's been a revelation. The chapters of the book are The Point, The Line, The Shape, Universal Contrasts, Color Contrasts, and Using The Tools. In this case The Tools include things like selective focus and vertical picture formats - most books would take this as an opportunity to explain what a camera is and when to use the pop-up flash. While I wouldn't want to discourage anyone from looking into this book, it's going to be most relevant for those who already have a pretty good idea of what they're doing. 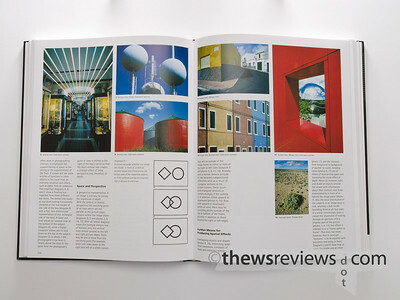 Originally published in German as "Das Foto: Bildaufbau und Farberdesign" in 2007, the English version's publication in 2008 must have rushed the process. I can't say that I have any complaints with the translation, but my sympathies go out to the person who did it. The language and concepts can be quite dense. I have far less compassion for the person or committee responsible for the book layout, and can only hope that they had the format forced upon them from the original work. Quite frankly, the layout and typesetting is a major impediment to understanding and appreciating the content. from a loose cluster of points. Really grokking the text is hard enough without the extra challenge from the formatting. Here's an image of pages 108-109. The columns of content of the lower half of the pages are: body text, body text, notes on the diagrams, diagrams / body text, blank, photograph, body text. In this randomly-chosen two-page spread, the text jumps across half the page twice, and once skips a column for absolutely no reason. The images on the page don't particularly line up with the text - it's common to have to flip pages to see the photos that are being discussed - so the only purpose to leaving blank space in the middle of a sentence must be to make the text physically run for the number of pages that the photos in the chapter require. 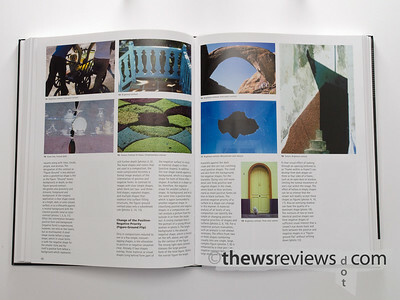 There's a lot to read in The Photograph, and it's a book that must be read with it lying flat. Be ready to flip pages and take time with it, both because the photos being discussed will span the chapter, and because it's very easy to lose the thread of the information. The photos that are included in each chapter aren't particularly tied to the text on the page; the spread above is pages 98-99, and includes photos #12-19. The text shown here mentions - in order - photos 1, 5, 6, 11, 2, 5, 3, 14, 15, 5, 2, 9, 19, 7, 8, 4, 16, 17, 18, and 13. This is the last page in the chapter, which is why it never refers to photos beyond this page - otherwise the photos would be even less synchronized with the text. Pages 108-109, which is the middle of a chapter, shows photos #6-12 and diagrams G, H, and I, and references A, B, C, B, A, C, 1, D, E, 2, 6, 14, 15, F, 5, 9-11, 18, 4, 16, 8, 19, 17, 8, 11, 7, 3, 4, 13, J, K. So while other books that study photographs, like The Nature of Photographs (reviewed) will tell you what to look at as a caption or text directly associated with a single image, Mante's book is more like walking through a gallery with all of these photos while the wise and insightful artist discusses what he sees in them all. Except that, unlike a gallery, the photos aren't all visible at once. It's almost worth deciding to go over each chapter twice: once for the text, to get an idea of the theory in one reasonably-consistent pass, and again to look at the photos that illustrate the points being discussed. The point of all of this nagging and pettiness is that this book fails in many ways. It's a very advanced book that deals with fundamental concepts, and so it requires careful and thoughtful reading. Make no mistake: I think that this book is worth the effort, and am slowly working my way through it fully knowing that I'll start reading it again as soon as I finish it. The reproduction quality is very good, the photos are useful and I find many of them inspiring. If I lost this copy, I'd buy another; if they release a second edition with better formatting, I'll buy it too. I've written elsewhere that there is a lot of similarity between the photographer and the typographer, and I'll expand that here to include the layout and typesetter's art. Like the photographer, they add to the message and provide the interpretation, but their role should be transparent. When a technical fault or poor choice reduces their ability to communicate, or becomes problematic for the viewer, they have failed. That a book dealing solely with the photograph from a design perspective should fall down so badly in its own design is an irony that even I don't find very entertaining.